Remember when they filmed Captain America: the Winter Soldier in our 'hood ? No? Well they did. 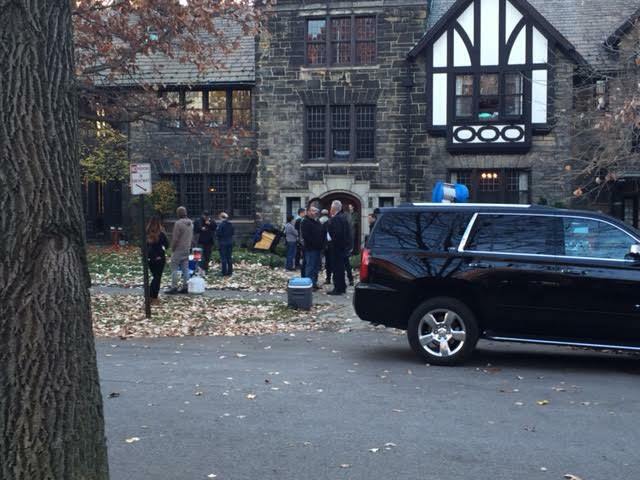 Now they're filming another movie - not only in said 'hood, but in the frickin' same house. It's a big budget science fiction thriller starring Cheryl Ladd. You see, one day some American thought: 'Hey, I want to make a terrible movie in Canada. Everybody else has!' I play the best friend of the time gate operator. He has one line, but he says it directly to me! The movie is full of Canadian actors with one line. It's great! It won't make a dime! Ok, that last part was Buddy Cole from Kids in the Hall. I couldn't resist. Just substitute 'Cleveland' for 'Canada'. Still, in the last few years we've seen a number of movies filmed here in town - mostly misses. Only the Avengers and Captain America probably made bank. I don't think Kevin Costner's Training Day made a dime. And I'm 99% sure that Matthew Fox and Tyler Perry's Alex Cross didn't make a nickel. Oh yeah, they filmed part of Spiderman III here too. I never saw that. Though I never saw Costner's movie or the Fox / Perry juggernaut - but to be fair, almost no one did. I guess you do have to be a big budget, science fiction thriller - with or without Cheryl Ladd - to make a dime, if filmed in this town. Will this new movie, named, yes, Dog Eat Dog, starring scary Nicholas Cage and scarier Willem Dafoe be a box office bonanza? And by "box office", of course, I mean "direct-to-video". I'm guessing the two "stars" will have to arm-wrestle for top billing. The loser gets it. I mean - great for Cleveland, getting the revenue of films actually getting produced here. I assume the reason the house is being used is that it has been up for sale forever and mostly vacant. Oh, and the head of the Greater Cleveland Film Commission lives not only in the 'hood, but on that street. As it turns out, they filmed in the house for 4-5 days, which oddly correlates to the exact same number of days it will play in an actual cinema. Yes indeed Mr. Brockman - only time will tell. Dog Eat Dog? Sounds like a turkey to me. Cheryl Ladd was my Gay Boy Crush in her Charlie's Angels days. wow- it looks like you live in a pretty tony 'hood. NIce.